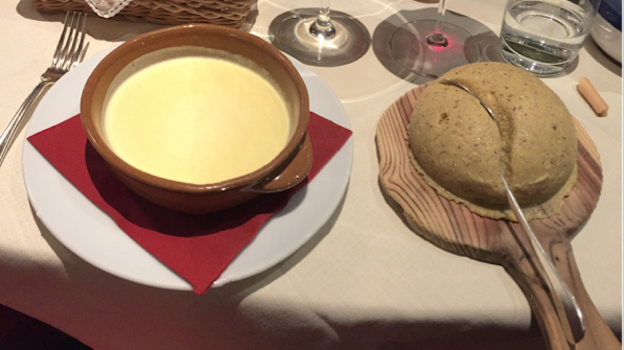 There are fewer more popular dining spots in all the Valle D’Aosta, Italy’s smallest and most French region (it’s tucked away in the northwestern corner of the country right on the border with France) than Cogne’s Lou Ressignon, a bastion of authentic, expertly cooked traditional regional dishes. So popular in fact, you absolutely need to reserve ahead, especially on Sundays when just showing up at lunch will only get you a rapid wave good-bye. That can hardly be an unexpected turn of events, given that Lou Ressignon has been open for business since 1966, when ski teacher and restaurateur Arturo Allera opened the place with his sister Elda and wife José (in fact, the restaurant is also known as Chez Artur). Today it’s the children, Davide and Elisabetta, who do a masterful job of running the restaurant. By the way, Lou Ressignon is not the name of a person, but rather a reference to a midnight snack, as per the local patois dialect. The restaurant is very pretty, all alpine charm with heavy drapes, white walls and wooden beams, nestled against a gorgeous mountain backdrop with crystal clear streams running everywhere. 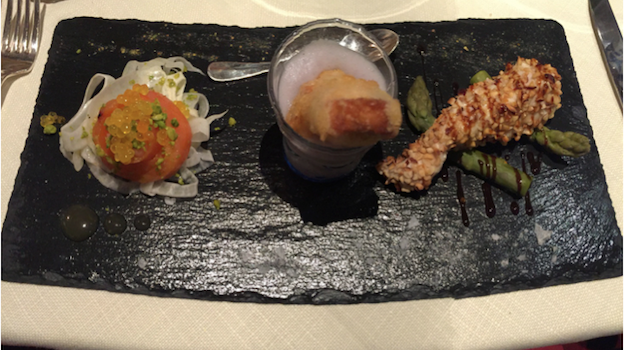 As far as the food goes, this is some of the best you’ll find not just in the Valle D’Aosta, but in any Italian country getaway. The variation of fresh water fish from Lillaz was light and airy, not to mention a perfect start to the meal, mainly highlighting the exquisite and delicate tastes of local trout. The individual portion of fondue is pure Valle D’Aosta, the creamy melt in your mouth fontina cheese fondue something you won’t soon forget. I simply never tire of this dish and never miss a chance to have a portion (or two). The accompanying side of whole grain, very tactile polenta is also a must try. The Cogneitse-style soup harkens back to a time when wasting food in poor mountain retreats was unthinkable and people needed to make do with what little they had. 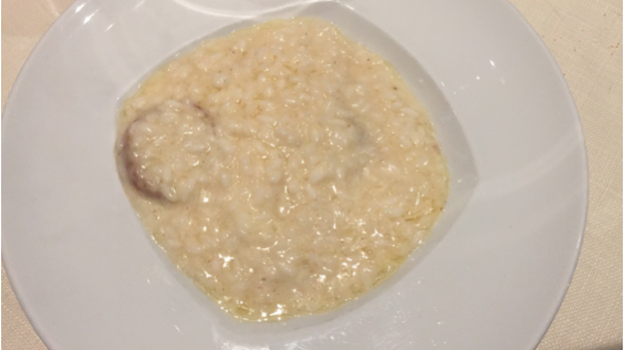 Not a soup at all but rather a risotto, this rice, beef broth, fontina cheese, old bread and nutmeg dish is one of the best traditional recipes of the region. Lou Ressignon’s version is hearty and satisfying, but also silky and seamless. Also good is the beef carbonade, a more delicate take on an historic recipe that originally called for salted dry beef (an effort to have the meat keep over the long cold winter months), lots of onion and wine. Modern versions have been lightened up considerably, and Lou Ressignon’s version, though concentrated, offers precise but easygoing flavors of noteworthy persistence. Last but not least, the crema di Cogne is simply magnificent and easily the best rendition of this famous dessert (a preparation of mainly cocoa, milk, eggs and vanilla, that is both lusciously rich and seamless) I have ever tasted. Wines are also a big part of the attraction of Lou Ressignon: the restaurant boasts a gorgeous lineup of Valle D’Aosta’s best vinous potables, in my opinion some of Italy’s best and most interesting wines of all. Unfortunately, they are also hard to come by, given the paltry production volumes of all but a few, making finding them a chore for anyone living outside of the immediate region. I started things off with the 2014 Crotte des Vegneron Chambave Muscat Vallée D’Aoste, currently the region’s best dry white muscat wine. The 2014 oozes orange blossom and grapefruit nuances, and finishes long, clean and remarkably dry, with no hint of residual sweetness whatsoever. 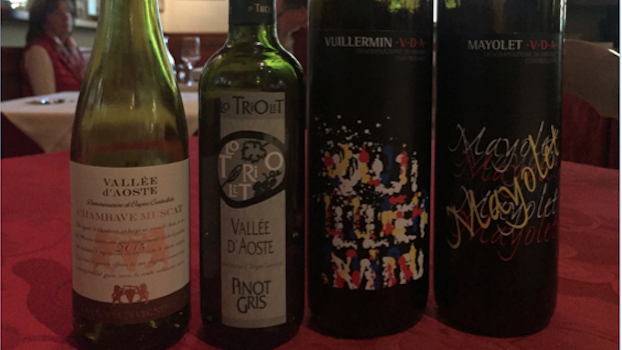 The 2013 Lo Triolet/Marco Martin Pinot Gris Vallée D’Aoste is another standout. This is hardly surprising given that Martin makes Italy’s best pair of Pinot Gris, the unoaked version redolent of white flowers and pear tasted on this occasion and a richer, vanilla-laced barrel aged version named “Elevée in barriques”. Next up are two of my favorite Italian red wines made from little known Valle D’Aosta native varieties, Mayolet and Vuillermin, both lightly aromatic red grapes. Both are from Feudo di San Maurizio, the high quality estate owned by Michel Vallet, who started in 1998 by recovering three old stone terraced vineyards and has since grown to be a real star in Italian alpine winemaking circles. Though still relatively unknown outside of the immediate regional area, Vallet makes some of Italy’s most variety-faithful wines. I drink them any chance I get. The 2013 Feudo di San Maurizio Mayolet Vallée D’Aoste is, in my opinion, the benchmark for the variety, a simply mesmerizingly perfumed red that would easily win legions of fans everywhere, if only there was more to go around. Think of this wine as an especially perfumed and fruity Beaujoulais Grand Cru (more Chiroubles or Fleurie than Morgon or Moulin-à-Vent). Unfortunately, though Mayolet’s penetrating lavender, violet, peppery and nutmeg aromas make it an unforgettable drinking experience, its extremely compact bunch is a rot magnet and many producers are giving up on the cultivar. I hope that Mayolet continues to be produced by quality producers such as the Cave des Onzes Communes and Feudo di San Maurizio, as nothing would make me unhappier than its disappearance. Just as good is the 2011 Feudo di San Maurizio Vuillermin Vallée D’Aoste, also the benchmark for this variety; those who prefer slightly larger scaled wines with plenty of spicy floral perfume will warm up to Vuillermin more so than to the lighter bodied Mayolet. In any case, the aromatic charms of both made these wines perfect partners for the carbonade I chose to have as the evening’s main course. Bright and early the next morning, while wading though an impossibly beautiful mountain stream harboring mindbogglingly beautiful little brown trout in truth not all too keen on biting into my fly patterns, I found myself still thinking of the previous day’s great lunch at Lou Ressignon. And if that happens while fly fishing for trout in one of the most beautiful places in the world, then you just know it truly was quite the meal.